An exceptional, attractively furnished and decorated luxury apartment in prestigious Puerto Duquesa. It is two-bedroomed and overlook the picturesque marina, with superb views across the mountains and Mediterranean to Estepona and Marbella. The lively, colourful and palm fringed marina is served with a wide range of bars, restaurants and shops. The apartment has its own access to two shared, guarded pool as well as direct access to a good quality local beach with lifeguards. A wide range of shopping, entertainment and nightlife can be found in nearby Estepona, Puerto Banus, Marbella and Gibraltar. The historic towns of Seville and Ronda and the delightful mountain White Villages are also readily accessible. The apartment is ideally located for the two local golf courses and also the more prestigious courses of Valderrama, Sotogrande and San Roque etc which are within half an hour’s drive. The ensuite bathroom has bath/shower over, wash-basin, WC and bidet. A separate bathroom has bath/shower over, wash-basin and WC. Towels for use in the apartment are provided but these are not for use at the pool or beach. For most rentals there will be wine, milk, biscuits and some tea and coffee. You will also find a number of condiments and herbs etc. The separate kitchen is fully equipped with electric oven, hob, fridge/freezer, microwave, dishwasher and all basic cooking pots and pans for those staying for longer periods. Dining is in the lounge dining room. Additionally, you can eat outside on the terrace where there is another table and four chairs. A high chair can be provided for an additional fee. The balcony has a table and chairs for outdoor dining. Puerto de la Duquesa lies in the centre of Europe's premier golf courses, suitable for both novice and the most skilled. Courses range from the local par 72 Championship Golf Course with driving bay and putting greens to the acclaimed Valderrama Course (Ryder Cup 1977 host). Sotogrande, Aloha, La Quinta and San Roque are all within a 20 minutes drive. The apartment block has ramps for wheelchair access and the apartment is on one level. There are two pools - the main pool is set in landscaped grounds and is at ground level with a gate leading directly out to the promenade and beach. There is a second pool on Level 3. Notes on accommodation: This well-appointed apartment is fully air-conditioned / heated and has stunning marina and sea views. The apartment is suitable for all ages with stairs and lifts. It has pools with lifeguards that are for residents use only. Sorry - no pets allowed other than guide dogs. All linen/bedding is provided except beach towels and all energy costs are included. 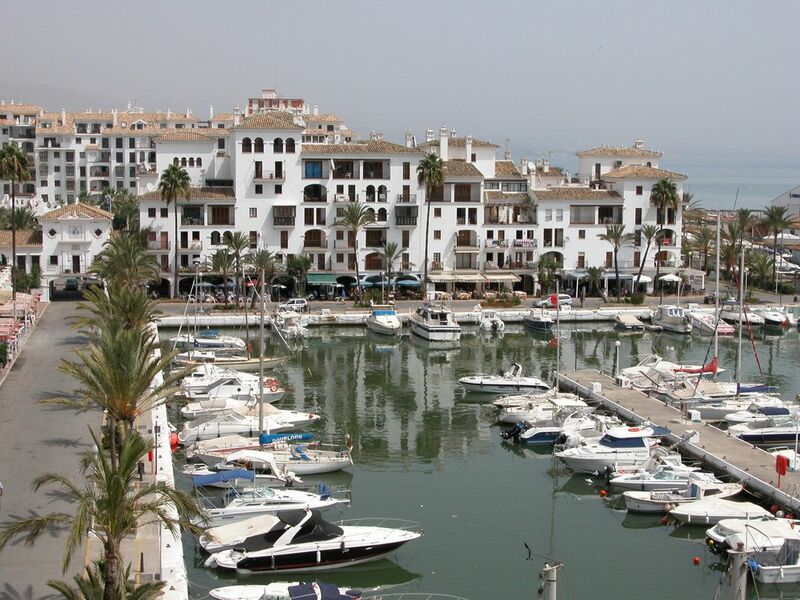 Outside: The apartment block is well maintained with its main entrance onto the marina itself. The lower pool has direct access onto the promenade and beach. There is lift access to the underground car-parking. The apartment is in a great location with super views over the marina, unfortunately because of Sun position very little reached the balcony later in the year it would be much better. The apartment itself was perfectly fine and well equipped. We originally had a problem with the wi-fi because it was part of a communal system and was very iffy. However, on reporting this to Deborah it was dealt with very swiftly and the apartment now has it's own system and has very good reception. The port has an excellent selection of bars and restaurants. there is a very good supermarket within walking distance with a very good range of produce. Overall we were happy with everything except the weather which of course is down to luck. I would have no hesitation in recommending this accommodation. Sam mckay, stay Feb. - march 2019. The property is in a great location directly on the marina. It is comfortable and has all you need for a great holiday. The balcony gets very limited sun but that really is the only negative. Great location for bars marina beach and surrounding areas, comfortable apartment with everything you need. Nice apartment with all you need. Great location convenient for all the bars and restaurants, we only had to walk out of building, no need for a car once you arrive. Lovely view from terrace that we will miss. We hope to return once the summer comes. Nice apartment overlooking the port. The apartment was clean and tidy and has spectacular views looking over the port. One big downfall is that the noise of people and music can be heard loudly till the early hours. We expected this when we booked but not till 3 in the morning. Also it is difficult to locate the pools as there are no signs or information outside of the apartment, in fact one of the pools could only be reached by going through the main garage downstairs. On a more positive note the accommodation is within easy reach of all the bars and restaurants with minimal walking but lots of steps. The apartment had outstanding views across the marina with easy access to the bench, bars and restaurants. The two bed apartment was very clean with a bottle of wine, water and milk there on arrival (this was extremely beneficial with our late flight). Deborah who is the point of contact was exceptional in terms of professionalism & communication. The apartment block is well maintained with the main entrance onto the marina itself. The other entrance takes you to the pool and from there has direct access onto the promenade and beach. The main airport is Malaga at 55 minutes drive with easy access and car hire facilities. Gibraltar is nearer at 30 minutes with car hire available from Gibraltar or just over the border in La Linea. Day-trips to Ronda, Seville etc are available - see Special Interest section. For those wishing to spend more time exploring inland car hire is recommended. Eastwards - Estepona 15 minutes, puerto Banus 25 minutes, La Cañada Shopping Centre (north Marbella) 30 minutes, Marbella 35 minutes, Malaga Airport 1 hour 10 minutes (using Peaje sections of E15 motorway 55 minutes). Westwards - Sotogrande 15 minutes, Gibraltar 30 minutes (not including border crossing times), Tarifa 45 minutes. Using other inland roads, approximate driving times on request. This luxury apartment is tastefully furnished to very high standards and is situated on the marina front itself. Puerto de Duquesa lies on the edge of some of the most splendid mountain scenery and National Parks in Andalucia. The Costa del Sol generally is famous for its coastal resorts and golf courses all of which are easily accessible from Puerto de Duquesa. Marine activities available locally include swimming, sailing, windsurfing, sea fishing, whale and dolphin watching and relaxing on the beach. All amenities are available locally including bars, restaurants, shops, banks, supermarkets, beauty salons, fitness centre, pharmacies and clinic, most of which are bi-lingual. Booking Notes: Changeover Day: Any day depending on prior bookings.